Can you tell yet what my views on bull fighting are? Let's just say "not favourable" and give me chance to tell you why, along with the unbiassed facts behind it all, OK - and some biassed facts too. First, before someone tells me supporters don't call it a "sport", it's an art, if you pay for satelite TV here in Spain, you could end up having three bull fights a day on the Spanish "sports" channel. So, whilst Spain is one of the countries most connected with bullfighting (along with Portugal, Mexico and France, Colombia, Venezuela, Peru, Guatemala and Panama to name a few), many Spanish councils have banned any form of bullfighting in their regions and I am happy to say that the Canarian government has banned all forms of fiestas and sporting events involving bulls. So, if you were looking forward to seeing a bullfight, you won't see one here on Lanzarote or any of the other Canary islands. A long time ago, I thought bullfighting involved letting a bull loose in a ring with the "matador" who then had to dodge it using his cape whilst trying to weaken it with a sword, eventually killing it. If that's all it was, bad enough as that is, I could see why it is termed as a "sport". That's far from what happens though. Here are the "unbiassed" facts with anything biassed in (brackets). First, the bull to be fought will be 3 or 4 years old. (Never older than 4 as they grow too large and too strong). The fight is split into "tercios" or thirds. The first involves a "picador" on horseback (more on the horses in a while, believe me when I say they suffer) who uses a "pica", a spear, to stab the bull in the neck, usually several small wounds with one wound made deep. This is to weaken the bull's neck muscles and prevent it from raising it's head too high, too often. The act of raising it's head now would cause severe pain. (The bull is also loosing a lot of blood and starting to weaken from this stage on). The second "tercio" involves 5 "banderilleros", men who will come at the bull with their capes as a distraction whilst each must place a dagger in the bulls back. One of the reasons behind this is to liven and enrage the bull who, after receiving a possibly fatal wound in stage 1, may have given up the will to fight. Again, each wound inflicted with each dagger will physically weaken the bull further. The third and final "tercio" involves the "matador", perhaps the best known member of the (killing) team. Upon entering the ring, he has ten minutes in which to kill the bull. If after this time the bull is still alive, a further five minutes are allowed but if it's alive after this, (what's left of) it's life is spared. Just before the 10 minute mark, the idea is for the "matador" to place his sword between the bull's shoulder blades and sever the aorta. If this fails, another sword is thrust behind the back of the bull's next so sever the spinal cord. After the first 10 minutes and as the first warning is given regarding time, the crowd can petition the judge - by waiving white handkerchiefs in the air - to allow the bull to live if they think it's been brave and fought well. However, often the crowd will petition the judge for a "vuelta" once it's been killed. A "vuelta" is a lap of honour involving a team of horses dragging the bulls carcass around the ring. Once the bull is down - severed aorta or spinal cord - the judge may award a prize to the matador beginning with 1 ear for an outstanding performance, better still 2 ears and the best, 2 ears and a tail. It's not uncommon for these to be cut from the bull before it finally dies. That I'm sorry to say is fact and to me, sounds horrifying. The art involved by the matador is dodging the bull as it charges. A famous woman bullfighter in Spain, Cristina Sanchez, is quoted as saying in the Spanish newspaper "El Mundo" (7/20/96), she affirms bulls "never suffer, I never noticed it" and adds that she loves animals. She says that bulls are beautiful animals "with whom I can create an act". More: "They are brave, born to die in the ring and help create an act of art with a person". And here she describes her “love” for the bull: “After running a while and getting over the shock of being in a bullring the animal is furious and adrenaline is flaring fast through its blood. If it is not bled, the bull may die. 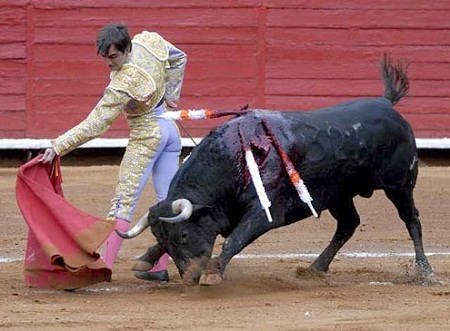 And we matadors love the bull, and don’t want to see it suffer. Bulls are the ones that make us or break us.” I should also point out that matadors in Spain are like movie stars or pop stars everywhere else, often making guest appearances on TV. Oh, did I forget to tell you what happens to the bull before the fight?? Before entering the ring, the bull is often handicapped - although this is officially illegal - by filing its horns so that it misjudges attempts to gore the matador and by smearing vaseline into its eyes to blur its vision. The bull might also be beaten with clubs, its ears and nostrils may be stuffed with cotton wool, and it may even be drugged to further obstruct his senses. Normally a veterinary surgeon, who is to be present before and during the fight, has to declare that each bull meets the requirements regarding the health, age and weight. However, some of these vets may be part of the bullfighting establishment and therefore may be prone to overlook certain manipulations. Most traditional bullfights pass through several distinct stages. Just before the fight begins, a steel emblem of the breeder's mark is driven into the animals back, and from its darkened quarters the bulls sent into the ring already in a state of terror. It is let out so that it faces the sun and is dazzled by it, a herd animal alone in strange surroundings. Bulls will sometimes be given massive doses of sulphates (epsom salts) in their water to induce severe diarrhoea, intestinal pain and subsequent lack of co-ordination in the ring. The chief veterinarian at Las Ventas bullring in Madrid has revealed that bulls from the fights have been found to have up to 25 kg of sulphates in their systems, whereas only 4 or 5 kg is considered to be a brutally massive dose. The veterinarian also discovered that sometimes the bulls are given drugs to sedate them before entering the ring. The sedative Combilin, a hypnotic and tranquillizing drug, may be injected into the animals so that by the time they are sent into the ring their senses are in complete disorder. During transit from breeding farm to bullring, they are crushed into small transit vehicles without food, water or space to move and many cases of bulls being dead upon arrival (due to their necks breaking when transferred in vehicles too small for them). The supply of bulls for the ring is highly organized. All over Spain, there are bull farms where animals are reared and chosen specifically for fighting. Toro de Lidia, the fighting bull, has been bred exclusively in such farms to be used in bullfights. A good fighting bull is worth many times more than an ordinary bull. The best bulls are sold to the main fights, the second best to local fights, and the "lower quality" ones often end up tortured and killed in cruel village fiestas. There are some animal welfare laws in Spain, but these are seldom enforced. However, Bullfighting specifically excluded from such legislation. Even the EU has declared bullfighting a protected activity under the heading of National Culture. A law dating from 1929 stated that children under the age of fourteen should not attend bullfights. However, in 1992 the Minister of the Interior, José Luis Corcuera, presented a new law repealing this prohibition. Therefore, children are legally desensitized to animal suffering from an early age. (June/96) Matador Ricardo Ortiz, from Málaga (Spain), held a corrida in support of the restoration of the Cathedral of his home town. The whole town was invited to the event to add their small contribution with the entrance ticket. The Major of the city, Ms Celia Villalobos, thanked Ortiz his gesture and offered all her support to the initiative. 11.500 people were expected to attend the corrida, 20 million pesetas, after the torture of six brave bulls. The presentation of the benefic corrida took place in the Town Hall and the Bishopric. For every religious festival in most cities, there are bullfights, often daily over a week around the date in question. Most popular seems to be easter with fights spreading daily over 10 days but all festivals are celebrated in this way, along with "running of the bulls" and other traditions involving attaching fire and/or fireworks to a bulls horns to start it running through the streets. Reading the newspaper one day I found 25 major town/cities in Spain (forgetting smaller towns and villages - hundreds of those) that were celebrating festivals with bullfights. Under WSPA’s leadership, United States and European animal protection agencies are lobbying Pope John Paul II to call for an end to religious ceremonies and public events that incorporate violence against animals. Anyway, the government is happy enough about it all as long as there is support by the people for it and as long as it attracts tourists and money. All of this being in place, no laws are on the horizon to reduce, restrict or ban bullfighting. I leave you in this last section with some more facts I've found. (January 1997) The Community of Madrid (a local government, one of the 17 existing in Spain) has given 14 million pesetas (170.700 US Dollars) to be shared between 84 towns of this Community to promote bullfighting activities. The donation of this money contributed by the tax-payer has been strongly criticized by ADDA. Action, write to: Alberto Ruiz-Gallardon, Presidente de la Comunidad de Madrid, Puerta del Sol 7, 28013 Madrid (Spain) - Fax: +34 1 580 2068. Every year, approximately 35,000 bulls are tormented and killed in bullfights in Spain alone. Although many bullfight attendees are tourists, 90 percent of these tourists never return to another fight after witnessing the relentless cruelty that takes place in the ring. Spanish bulls and their many counterparts in Mexico and other countries are victims of a savage display disguised as "art" or "entertainment" that noted Mexican author Eduardo del Rio described as "a stumbling block for the humanization of man." Many prominent former bullfighters report that the bull is intentionally debilitated with tranquillizers and laxatives, beatings to the kidneys, petroleum jelly rubbed into their eyes to blur vision, heavy weights hung around their neck for weeks before the fight, and confinement in darkness for hours before being released into the bright arena. A well-known bullfight veterinarian, Dr. Manuel Sanz, reports that in 1987 more than 90 percent of bulls killed in fights had their horns "shaved" before the fight. Horn shaving involves sawing off several inches of the horns so the bull misses his thrusts at the altered angle. The bulls aren't the only victims of the intense cruelty of the arena. According to Lyn Sherwood, publisher of an English-language bullfight magazine, horses used in bullfights are "shot behind the ear with dope. The horses are drugged and blindfolded and they're knocked down a lot." These horses, who are often gored, usually have wet newspaper stuffed in their ears to impair their hearing, and their vocal cords are often cut so their cries do not distract the crowd. Fight promoters claim the horses are "saved" from glue factories; this means these animals are often old, tired plow horses who end up being knocked down by bulls weighing up to a half a ton. Bulls today are specially bred for bullfighting. Selective breeding has enabled ranchers to create a bull who will die in a manner most satisfying to the public. Because the sight of a wounded bull desperately trying to retreat from the ring would ruin the image of the "sport," bulls are bred to return to the torture repeatedly and appear to be a wild and vicious challenge to the matador. Recent polls of Spanish citizens show they are not particularly interested in attending bullfights. Even bullfight promoter Sherwood admits "there's no way to morally justify bullfighting." But tourists' money keeps bullfight profiteers in business. Council's here in Spain have often found other, temporary uses for the "Plaza the Toros" (bullfighting ring) from international tennis tournemants (Mallorca), football (Seville) and many music concerts, so there's a future for the buildings, let's hope there can soon be a future for more animals. Don't go to a bull-fight and if anyone you know is considering it, pass on this information to them. If you are planning to visit a country that permits or encourages bullfighting, please tell your travel agent you are opposed to animal cruelty in any form. Many tourist resorts are building bullfight arenas as part of their "recreation" facilities; refuse to stay at such a resort, and write a letter to the owner explaining why you will not stay there. Instead, visit the resort town of Tossa de Mar (which was the first town in Spain to ban bullfights and related advertising) or the Spanish Canary Islands. Tell others the facts about bullfighting and urge them to protest as well. When tourists stop attending bullfights, profiteers will stop the cruelty. ABC (Anti Bullfighting Campaign) International was founded in 1993 by ADDA (Spain) and Foundation Committee Anti Stierenvechten (CAS, The Netherlands). It's aim is to become a source of information and updates about what is happening in the world of bullfighting for those against it. We exchange information, campaign strategies, materials, and organize petitions, fund-raising, demonstrations, news letters, statistics, etc. We publish a special bulletin every three months with updated news about bullfighting. Write to Pepsi Cola and ask them to stop sponsoring bull fights. They are by far the largest sponsor/advertiser in Mexico, a country where bull fighting is rapidly expanding. Whilst they claim they don't pay for the advertising, they sell their product in the rings and their posters are displayed to promote it. PepsiCo, Inc. 1 Pepsi Way Somers, NY 10589 U.S.A.
Other sponsor include Domecq, the Sherry Giant, Gillette & McDonalds - boycot them! A very good page that summises everything that happens in the ring from a tourists point of view can be found HERE. It's also a good link to see some relevant photos.